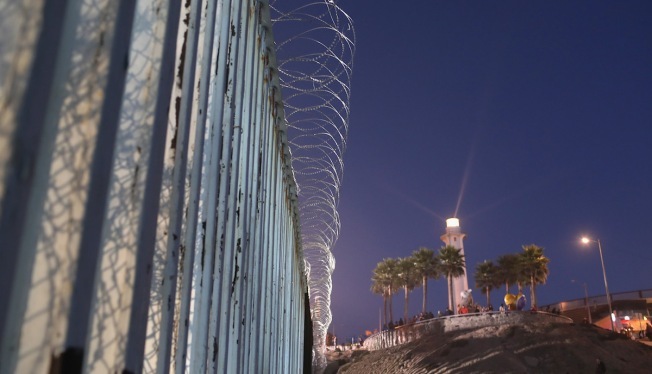 A Mexican lighthouse shines above the U.S.-Mexico border fence on Nov. 16, 2018, in San Diego, California, as seen from Tijuana, Mexico. U.S. border agencies continued to fortify the fence with razor wire as members of the migrant caravan arrived to Tijuana across the border from San Diego. An undocumented migrant mother was injured at the U.S.-Mexico border in south San Diego Friday night when she tried to illegally enter the United States by climbing a barbed wire fence with her two small children. The incident happened just before 8:30 p.m. at East San Ysidro Boulevard and Rail Court, an area east of the San Ysidro Port of Entry. U.S. Border Patrol agent Tekae Michael told NBC 7 the 26-year-old mother fell from the primary border wall onto pieces of rebar on the ground. The rebar pierced the woman's side. Tekae said the rebar is part of a primary replacement wall being built at the border. The children – ages 3 and 5 – had also attempted to climb the fence with their mother but were not hurt, Michael said. Border Patrol agents helped the woman after her fall and called paramedics. The mother was taken to a local hospital for treatment. Tekae said the children were also taken to a hospital for medical evaluation to make sure they hadn't suffered any potential fall trauma. The children were then turned over to the U.S. Border Patrol. Michael said the family is from Guatemala but the Border Patrol agent said they were not part of the migrant caravan currently heading to the nation’s southern border. Michael said the mother would be treated, processed by Border Patrol and turned over to Immigration and Customs Enforcement (ICE). She is expected to make a full recovery. The agency said climbing the border fence should never be attempted. "Entering our country illegally, particularly over our walls is not only dangerous, but also very foolish," San Diego Sector Chief Patrol Agent Rodney Scott said Saturday. "This woman placed her own life and her children’s lives in peril. She could have easily died if not for the quick response by our agents and EMS." The fence at the U.S.-Mexico border has been reinforced for the past few weeks to keep migrants from illegally climbing into the U.S. as a caravan of thousands of migrants from Central America makes its way to the border. The migrant caravan has made its way by foot and bus from Central America to the southern border of Mexico and from there to Tijuana, where thousands are now living in overcrowded shelters until they can seek asylum from the U.S. In response to this potential influx of migrants, the Department of Defense sent approximately 5,800 active duty, reserve and National Guard troops – including 1,100 Camp Pendleton-based U.S. Marines – to span the border to assist the Department of Homeland Security (DHS) in the “hardening” of the border. Concertina wiring was added to the border fence, too. Last week, when DHS Secretary Kirstjen Nielsen toured the fence she told reporters that those border fortification efforts would continue with the help of the military. Nielsen called the migrant caravan a “crisis” that could mean serious trouble for the U.S. She said traveling with the caravan does not give migrants “a special right to enter this country” and that those migrants would have to “get in line” when it comes to the asylum-seeking process.